When trying to lower cholesterol, it is a natural assumption that you must eat a low cholesterol diet and one that is also low in fat. However, not all fats are the same, and there are fats that you don’t necessarily have to avoid because in small quantities they can help reduce cholesterol. Others are more detrimental in causing weight gain and can make it even more difficult to lower cholesterol. Dietary fat, the fat that comes from the foods you eat, comes in several forms. There is saturated fat, monounsaturated fat, and polyunsaturated fat. These come in different foods and work to either raise or lower cholesterol. Saturated fat is found in such foods as red meats. The fat surrounding the meat or found throughout it is saturated and harmful because it raises cholesterol. Eating too much of this type of fat causes the body to produce more cholesterol. What isn’t needed in cell formation and transportation is stored in the blood. Other types of saturated fats come from dairy products, tropical oils, and vegetable oils that are in solid form. So even the vegetable oil that is used in margarine is harmful because in order to make it a solid is has to hydrogenated, which makes the vegetable oil into a fat that raises cholesterol. Monounsaturated fat and polyunsaturated fat can help to lower cholesterol, but should still be used sparingly. They still pack a lot of calories which will cause weight gain and work against your best efforts by raising your cholesterol. It is better to use other cholesterol lowering foods instead. In general, make sure you read the labels to avoid unhealthy, hydrogenated fats. 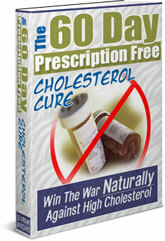 To learn more about eating right to lower cholesterol you can get The 60-Day Prescription Free Cholesterol Cure by Frank Mangano.